The typical locavore is skilled and interested in all things having to do with growing and preserving food. I fall into this category. Suddenly it is a necessity! Our freezer in the garage blew a fuse and half of my hard work lay in defrosted disarray. So tonight, I move to action. First, turning on SDPB Uncle Jim-o Jazz and pouring myself a glass of wine. Now, I can accomplish anything!! I am a mad woman in the kitchen cooking everything that is in defrost mode. Fortunately everything was still cold but I had to toss out gallons of stock, broth and homemade soup. (That was very sad). In my oven now are chicken breasts, a couple of Hutterite pot pies, some peppers I am roasting and something I am not EXACTLY sure what it is. 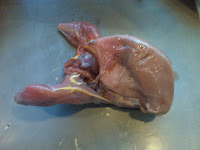 It's some game bird that friends brought over which I did not (bad!) label. I think it's a pheasant or maybe a grouse? Remember, this is South Dakota. The 'wings' look like lobsters in a twisted way. Anyway the critter is being roasted. Ever being the optimist, it's a great time to clean out the freezer. It's spring! The nice thing is that I have herbs growing in the garden so while I on this mad cooking binge, I am thinking of all the quick meals I can now put together this next week.